Water flossers are an effective alternative to regular string floss. They get deeper into the pockets in between the teeth. And they’re gentler on gums than toothbrushes. As well as removing food debris and plaque, water flossing helps prevent periodontal inflammation and infection. How? By flushing out bacteria which is responsible for gingivitis, along other oral diseases. Water flossers can also clean implants, crowns, and orthodontic appliances without wearing them down. Some people prefer corded water flossers. They like the convenience of storing them at home and the increased water supply that allows them to floss for longer without refilling. Alternatively, some prefer a cordless water flosser that can be used whenever and wherever necessary. This is especially handy when travelling. So which are the best cordless water flossers? 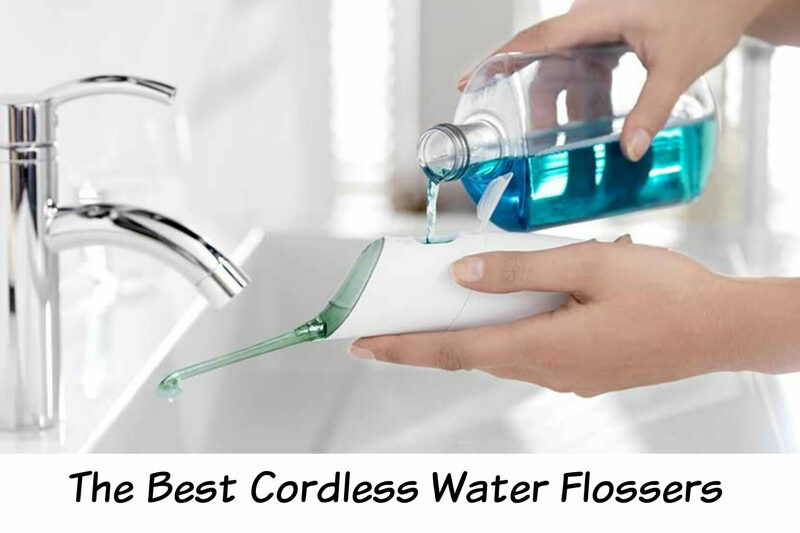 For superior results, it’s crucial that you pick the best cordless water flosser. The right model depends on how much you want to invest, and how you’ll be using it. Below, we review the five best cordless flossers. This guide is a result of intensive research. It’s entirely factual, accurate and neutral. 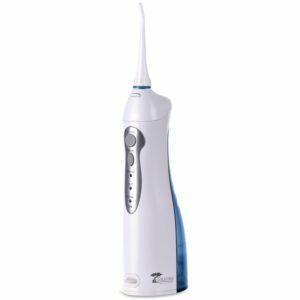 This model is a much-improved version of the 1st Gen Oral Irrigator by ToiletTree Products. It boasts a larger 6-ounce water tank, two interchangeable nozzles, and a 360-degree rotating nozzle. It has no removable battery. You simply plug in the adapter and make use of it wire-free once it’s charged. On a full charge, it’ll last an entire week if using it twice a day. It’s a perfect option for frequent travellers as it takes up a little amount of space. This waterproof flosser won’t get damaged even if you accidentally pour water on it. It’s incredibly portable and powered by two AA batteries. It’s only suitable for individual use as it comes with a single head. Space and storage won’t be an issue with the Panasonic EWJ-DJ10. It stands out with its noiseless operation, with the only noise being the natural sound of water shooting from the tips. This battery-operated water flosser is a perfect choice for small bathrooms and travel. It has a portable, waterproof design, offering two different pressure modes and three water flossing tips. That allows you to personalize the water pressure intensity. It comes included with an easy-to-fill reservoir and three AA batteries. Plus it has a travel bag to prevent leakage when traveling. You can use it in the shower as it is waterproof. 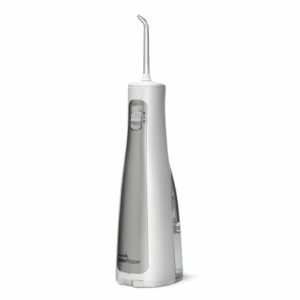 The Waterpik WF-03 is worth considering if you’re seeking an easier, more efficient and affordable way to floss. The Waterpik FLA-220 has been clinically proven to be more efficient than manual floss. It’s an easy-to-use irrigator that features flexible nylon tips that slip easily between the teeth. It’s also much gentler on gums when compared to many other flossers. This model features 15 easy-to-replace tips. It’s a gadget that will grant you more incentive to floss daily. For a portable option, the Waterpik FLA-220 is a Godsend to those with braces or other dental work. It’s able to reach many plague-prone areas in between the teeth where ordinary floss doesn’t reach. Save your smiley mouth with this affordable, yet effective water flosser. 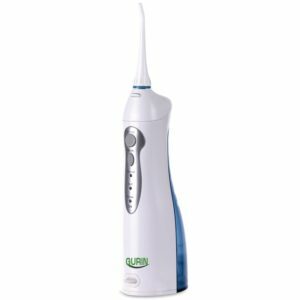 This Oral Irrigator by Gurin Professionals is an intuitive, easy-to-fill, and simple to use water flosser. This model, having two tips, can be used by two individuals. The battery lasts well on a single charge. This irrigator offers three different settings: SOFT for sensitive gums, PULSE for gum massage, and NORMAL. It’d be a fantastic bargain, especially on considering how durable it is, thanks to the quality build. It’s a model that will feel remarkably beautiful on your teeth and gums. Cordless flossers come in varying sizes, and with different features. Their obvious benefit is portability. You can carry them with you when travelling without space issues since they’re relatively small. There’s no need to worry about wires or cables and they’re ideal for children as there’s no risk of electrocution. The products featured above will contribute substantially to maintaining your oral health and winning smile.